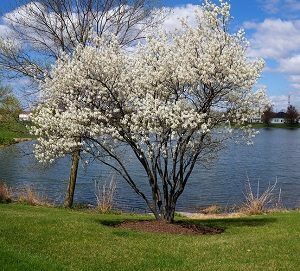 An example of NE native plants, the Amelanchier canadensis or Serviceberry Bush is a great edition to any garden. Throughout the year, homeowners across the country plant a wide variety of plants to improve their landscaping. However, most homeowners do not know how landscaping with native plants can benefit your garden and environment. Native plants have evolved over the years to the habitat they live in, giving you great benefits and a reason to plant them. Landscaping with native plants can save you more money, time, and resources than non-native plants. Since native plants are accustomed to their habitat, they are able to hold water better than non-native plants, which will save you significant amounts of water. Native plants can adapt to the typical amount of precipitation an area receives. Preserving water will lead to lower water expenses and increased savings. Native plants also tend to withstand the environment better than non-native plants. This allows them to withstand harsh weather and grow back the following year. Every year the plant grows back is another year you do not have to purchase a new plant to replace those that did not survive. Native plants are typically more resistant to disease, drought and other environmental risks than other plants. They can spread quickly to crowd out any weeds, which means less maintenance and upkeep for you. Many native plants grow in such a fashion that protects the soil from being flooded with water. This means landscaping with native plants will keep the soil rich and allow these plants to flourish in the environment. By landscaping with native plants in your yard, you are contributing to a natural habitat for the animals that reside in the area. Native plants typically produce, fruit, nectar, nuts, and seeds, which provide a natural source of food for many birds and animals within the area. In some areas, large amounts of wildlife depend on these plants and other natural sources to survive. Most native plants are not invasive and will allow all other plants in your garden or yard to grow freely. Plants that are invasive will only make landscaping more difficult. Invasive plants will control the growth of all other plants in the area—costing you valuable time and money. With less invasive plants, you have many more options with the open space provided. Because they are adapted to the specific climate of the region, native plants can defend themselves against indigenous insects, fungi, and disease. So instead of spraying the plants with artificial pesticides, they have a natural built-in defense system to protect themselves. By not having to use pesticides on your plants, you’re saving time, money, and helping to not pollute your environment and not causing damage to other plants. Native plants are a beautiful addition to every yard which, not only have an aesthetic appeal but also greatly benefit the environment. Want to learn more about landscaping with native plants at your home and all the benefits it can provide? Contact the experts at Greener Horizon and request a consultation.